I finally made a print larger that 3″ x 5″. 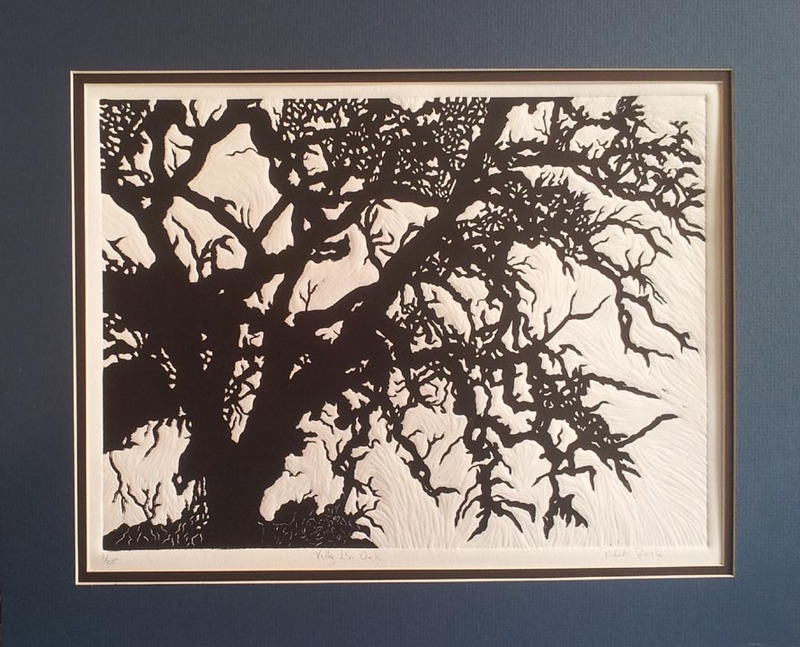 This winter image of a Valley Live Oak is 9″ x 12″. It may not be a remarkable size for most printmakers, but it is huge for me. It sort of reflects the tree the print is based on. The tree had a trunk about eight feet in diameter before it collapsed from old age. This is a linocut, and I am always disappointed when I use linoleum. It’s not that the print turns out differently when I have carved the block from pear or cherry, but the block is different. A linoleum block is just a linoleum block whereas a wood block . . . . In addition, printing with damp paper and putting the block through my press with enough pressure to emboss the print means the linoleum block breaks down much faster and I will end up with fewer prints. So why did I use linoleum in the first place? I had it sitting around in my studio and I didn’t have any pear blocks prepared. I will try to not make the same mistake again.